The world’s oldest known maths puzzle is called the Stomachion. A description is found in what is known as the Archimedes Palimpset, a copy of a text written by the Greek Mathematician Archimedes, who was born around 287BC. Archimedes is best known for his Eureka moment in the bath, however he was also one of the greatest mathematicians and engineers of all time. Some of his famous inventions and discoveries include the Archimedes Screw which could transport water up hill, and a calculation of the value of Pi. The Stomachion is what is known as a dissection puzzle, and consists of 14 pieces inside a square. 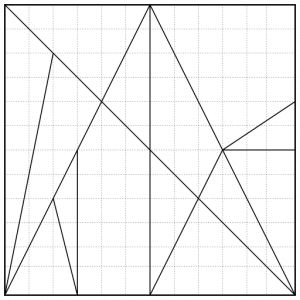 Other famous dissection puzzles include Tangrams and the Pythagorean Square Puzzle. It is likely that Archimedes would have challenged others to try and fit all the pieces of the Stomachion back into the original square shape. 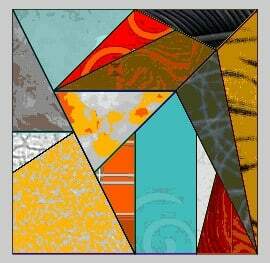 Other possible uses may have included assembling the pieces into familiar shapes such as animals or birds. Try printing a copy, shuffling up the pieces and having a go for yourself. The Stomachion was almost lost forever and we are lucky to know about it at all. The text describing the Stomachion was first written down in the 10th Century AD, and was copied from earlier works of Archimedes. In the 13th century this manuscript was scraped and cleaned and reused as a prayer book. This practice was common, partly because the underlying parchment was so expensive and difficult to get hold of. The manuscript containing a description of the Stomachion is called the Archimedes Palimpset – the word ‘palimpset’ refers to this practice of reusing earlier manuscripts, by covering them with new texts. In 1906 an Archimedes Scholar called Johan Heiburg began to investigate the text which lay hidden beneath the prayer book. Unfortunately the manuscript then disappeared from the Greek Orthodox library in Constantinople where it was kept. It resurfaced some years later in mysterious circumstances with a businessman called Marie Louis Sirieix who claimed to have bought it from a monk. During the disappearance a forger had added some sections of gold leaf, nearly destroying the text underneath, and it had also gone mouldy. In 1998 Sirieix’s daughter sold the Archimedes Palimpset at auction for $2million. It was purchased by an anonymous tech entrepreneur who then left it under the care of the Walters Art Musuem in Baltimore, where it could finally be analysed using up to date methods. Modern imaging techniques meant that it was now possible to read the original Archimedes Palimpset in full – including the only known copy of Archimedes’ writings on the Stomachion. If you spend some time playing around with the Stomachion, you will soon release that there are several different ways of reassembling the puzzle back into the square. Mathematicians started to wonder how many distinct solutions there are. A distinct solution means that it is not just a rotation or a reflection of a previous solution. In 2003 Joe Marasco offered $100 for the first person to come up with an answer. Bill Cutler soon claimed that prize with his solution of 536 distinct possible arrangements. What is not clear is whether Archimedes ever thought about the number of possible solutions, as this information is not given in the Archimedes Palimpset. Given the apparent genius of Archimedes, it would be fair to guess that he knew that there were multiple solutions, however he didn’t have the luxury of using computer programming like Bill Cutler did.